Welcome to the Holiday Inn Express Redwood National Park The Holiday Inn Express Redwood National Park is located on scenic Coast Highway 101 and the perfect location for your trip to the Redwood National & State Park. We are minutes from the Klamath Jet Boats and Trees of Mystery which are considered must sees on any trip to this World Heritage Site. During your stay with us, make sure to visit our Redwood Casino which is located adjacent to our hotel. Redwood Casino offers a variety of gaming, prizes and Las Vegas Style Slots for your entertainment pleasure along with dining options at Abalone Bar & Grill serving lunch and dinner. Our Holiday Inn Express Redwood National Park is only thirty minutes from the Del Norte County Airport and six hours from San Francisco International Airport and the only branded hotel located inside the Redwood National and State Park. Experience the rare coastal redwoods as the SkyTrail gondola takes you on a breathtaking round-trip journey through the forest canopy. See an incredible panorama of coastal mountains and sweeping ocean vistas from the summit terminal. Drive through an astounding sized 900-1,000 year old Redwood Tree. 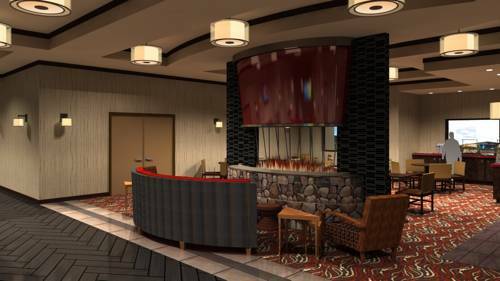 Just steps away from the Holiday Inn Express Klamath- Redwood Ntl Park Area Hotel is the new Casino opened by the Yurok Tribe. The Casino is a non-smoking property that offers the 50 of the newest machines on the NorthCoast. A sub-launched World War II Japanese plane hoped to start a huge forest fire with incendiary bombs. The remote site is marked with signs and commemorative trees planted by the pilot years later. Symbol of the local Caveman's Club, this brutish statue guards Grants Pass.